Veterans, Shawn Lee (Army) and Jacob Kirn (Marine Corps), take a break during a rock climbing trip. Kansas City-based Veterans are continuing their service, in part, through their contributions to help urban, under-resourced youths. In August, Shawn Lee (Army Veteran) and Jacob Kirn (Marine Corps Veteran) will be paddling across the State of Missouri - 340-miles - from Kansas City to St. Charles along the Missouri River in order to raise awareness and funds to support these youths through Exploring Roots' impactful, nature-based wellness programs. You can contribute to their fundraising efforts by clicking here. Exploring Roots is a veteran-led non-profit, with several core team members having served in Iraq or Afghanistan. Shawn Lee, who was enlisted in the US Army as an Infantryman for 8-years, now spends his days as an attorney, while also volunteering with the Kansas City Metropolitan Bar Foundation Military Matters program to provide pro bono representation to military and veterans. In his free time though, you'll find him somewhere in nature - beekeeping, rock climbing, riding his bike, or somewhere else - enjoying activities that have been an important part of his own healing process. Shawn served in Iraq from 2007-2008 as a scout/sniper with the 2/30 Infantry “Wild Boars” and saw some of the heaviest fighting of the war during the Battle of Sadr City. After that difficult tour, Shawn re-enlisted for the 101st Airborne Division and saw combat in Kunar Province, Afghanistan, where he received a Traumatic Brain Injury from an Improvised Explosive Device (IED). After coming home, Shawn had regular seizures that left him without the ability to drive for over a year. Out of necessity he began riding a bicycle for transportation. This turned into multi-state tours with Ride 2 Recovery, three separate Ironman Triathlons, and a sincere love of the outdoors. Shawn believes that getting engaged in the outdoors can be an important part of anyone's recovery - and research findings agree with his assessment that a connection to nature is essential for one's wellbeing. Shawn shared, "Racing the MR340 for charity made sense because I believe in this program’s mission. Kids need to learn healthy ways to recharge and heal themselves. Life is hard. School is hard. Relationships are hard. On top of all that we have a nationwide obesity epidemic as well as ever increasing prescription drug, alcohol, and narcotic abuse rates. Also if you look back and recount the minutes of your day, you’ll realize a large portion is spent staring at some sort of electronic screen. I don't think this is a healthy direction for society to go in and I hope to inspire kids to get outside and spend their downtime replenishing their minds and bodies through appreciation of Missouri’s outdoors. Working on juvenile division cases as an attorney also made me realize just how many children survive trauma equal to or worse than what many Soldiers experience in war. Juvenile victims are at heightened risk for substance abuse, mental health disorders, and suicide without medical and social intervention. Healthy diet, exercise, and socialization are essential to successful treatment of Post Traumatic Stress (PTS) and fortunately all three of these things are cheap. Therefore I hope to get these kids out on the water, out in the woods, and up on some rock walls climbing because those are the tools I’ve used to treat PTS ... Knowing these kids are facing challenges, and in some cases PTS, makes me hope to save them some heartache by getting them into an outdoor, exercise-based program early so when life comes knocking with trouble, they will have tools to heal themselves instead of further injure themselves." Jacob Kirn grew up with a love for the outdoors and adventure, so as he got older the longing for adventure only grew stronger. His first big journey came with a trip to the Marine Corps Recruit Depot in San Diego, where he became a “Hollywood” Marine. Jacob still claims that this was one of the best and worst adventures of his life. During his five years as an in-flight mechanic on the C-130T, he spent time in seven different countries and served at various locations around the US. After completing his active duty time in the Marine Corps, he continued his service as a teacher at one of Kansas City's inner city schools, while continuing his military career in the Marine Corps Reserve. 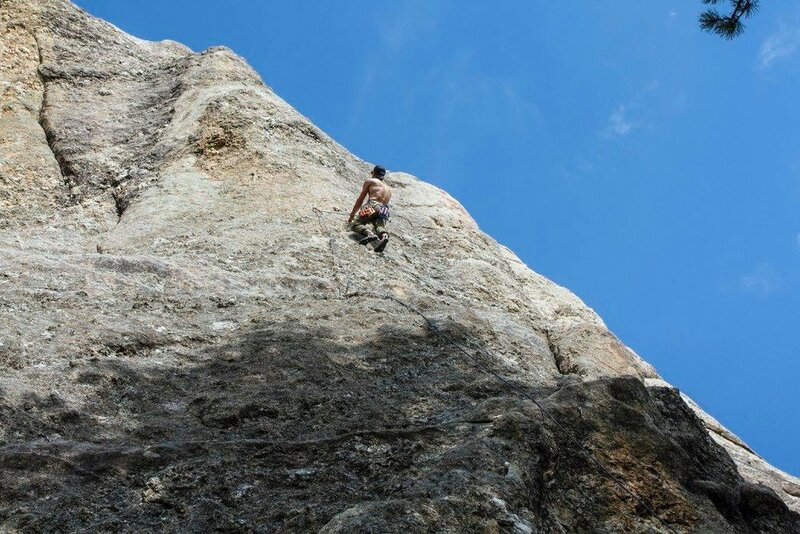 Jacob's craving for adventure wasn't satisfied, however, so he picked up rock climbing, which has become a favorite hobby. This is where he discovered Exploring Roots while climbing at a local climbing gym, ROKC, that was established by another Veteran - Andrew Potter, an Army Ranger who served on 3-tours to Afghanistan with the 75th Ranger Regiment, who is an Exploring Roots Board Member. Andrew led Jacob to Exploring Roots, and Jacob decided to get involved in the mission. Jacob and Shawn first met through the Kansas City Climbing Community, and later decided to paddle the Missouri River via the MR340 as a fundraiser for Exploring Roots. Jacob and Shawn aren't the only veterans involved in these efforts. Exploring Roots is a veteran-led non-profit. Founder and Executive Director, Adam Magers, is also an Iraq Veteran who found that nature was an essential part of his healing experience while studying depth psychology and engaging in outdoor activities. Board Members, Andrew Potter (mentioned above), and Dale Duncan (a Gold Star Father whose son, Spencer, was killed in action in Afghanistan) are also critical members of the organization's efforts. You can learn more about these team members here. The funds raised through Jacob and Shawn's efforts will go directly to support an Exploring Roots program that supports inner city youths who are encountering a myriad of difficult challenges. Research suggests that programs, like those offered by Exploring Roots, can make measurable, positive impacts on the psychological and physical health of participants. To learn more about Exploring Roots, you can click here or visit www.exploringroots.org.